Please help Ginger! Check our "Ginger needs you" tab! Cat Adoption Days! 3rd Saturdays of the month - April 20th and May 18th from 12noon-3pm. Come see recent arrivals, help a young adult or senior cat have a chance to love again. Our adoptions center is located at 400 Main St. in Peekskill (corner of Main & Water Streets). Cats also shown by appointment. 914-734-2989. Cat Food Drive! Friskies pate, Fancy Feast Classic and dry food - Purina Cat Chow Complete. Drop off at our thrift shop, 960 Washington St. in Peekskill. Open Tuesday and Thursday-Saturday from 11-4pm. Thank you! Volunteers needed for Saturday p.m. shift at our adoption center, call our rescue line if you can help - 914-734-2989. 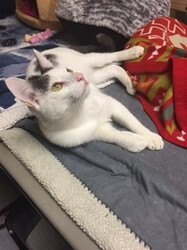 Possum is a sweet 1 year old boy who gets along with dogs and most cats. He wouldn't do well in a home with multiple cats. He's waiting for his forever home! Nominate LOA in Cat's Pride Litter for Good program! For every green jug of Cat's Pride Fresh & Light bought, Cat's Pride will donate a pound of litter to help shelter cats across the country. Head over to Catspride.com/litterforgood today and nominate our shelter to receive free litter - the more nominations, the more litter we are eligible to receive. Thanks for all the support! Use www.goodshop for all your shopping needs! Merchants donate up to 6% of your purchase. Choose LOA for your charity! Amazon donates 0.5% of the purchase price to LOA! Next time you do some shopping try the link above! Choose Little Orphan Animals, Peekskill as your charity! Thank you!